Fishing – Affected tremendously by the abrupt change in weather. Some high spots and some big fish, but overall, the fishing took a dive…or the fish took a dive. Either way, fishing got tougher. Hate to think the awesome tuna bite of 2018 is over. On the bright side…huge huge pargo caught! 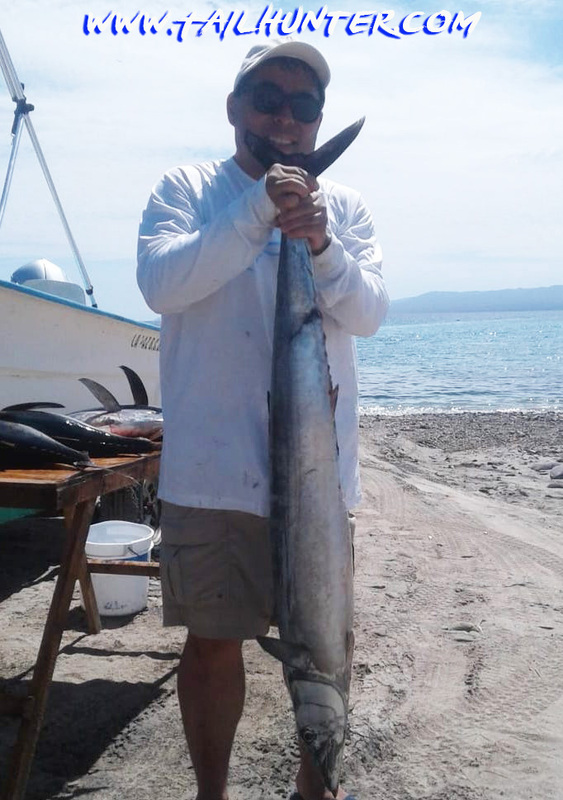 Incredible catches…and losses of gigantic fish too. Water – Air temps went down, but water stayed warm! At least for now. 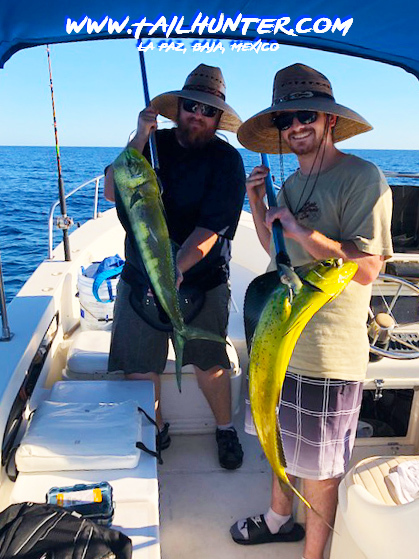 The winds sure made it rougher than normal and if the winds keep blowing the waters will definitely cool and the fishing will change even more. Outlook: More winds expected this week, especially from the north which is usually a sign of winter weather approaching and rougher seas. Possibility here and there or rain showers, but mostly sunny week ahead. 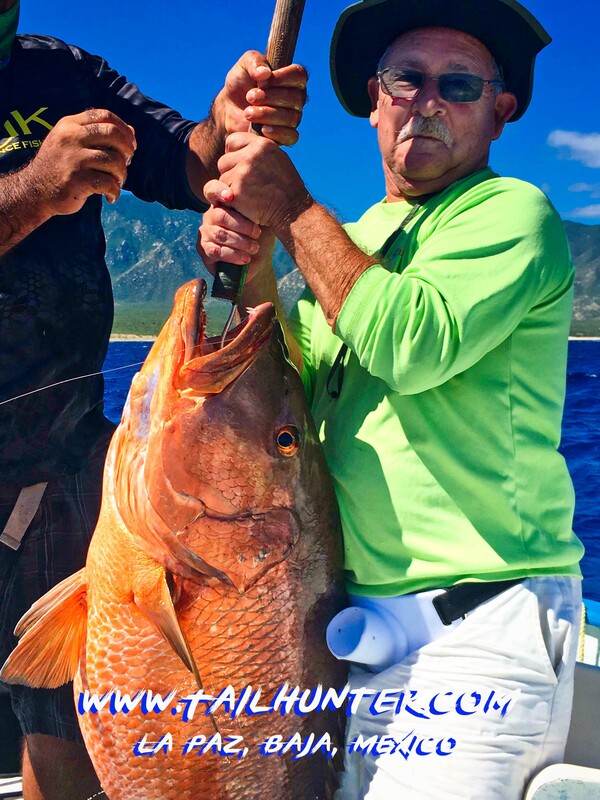 Hard to believe the size of these dog-tooth cubera snapper we were catching this week or the number of them. Have never seen anything like it! We were using whole bonito to hook them and losing many fish as well. Captain Victor poses with a smiling Jim Gatti and Nino Bonfiglio from Sacramento CA. 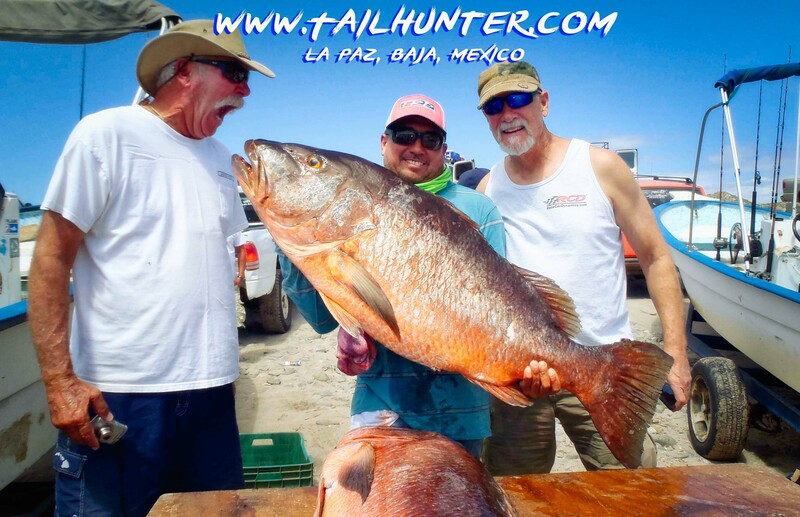 Check out two more big pargo dogs on the table! 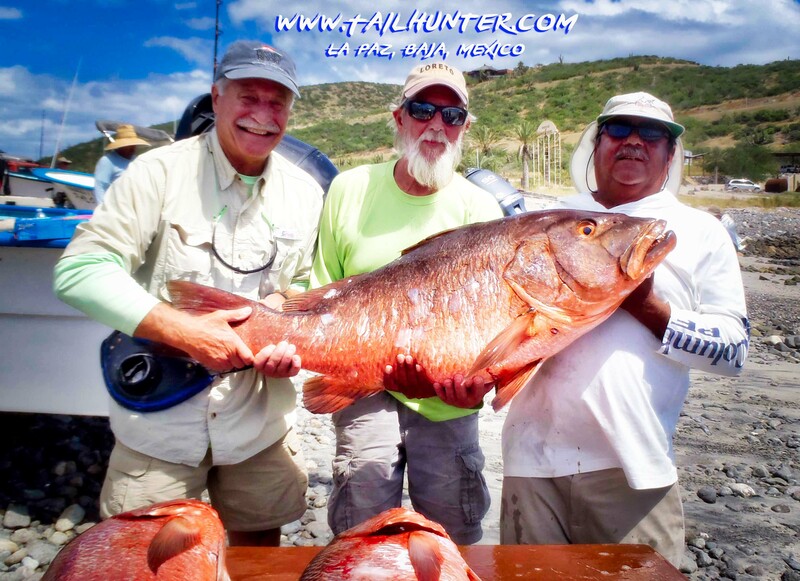 Jerry Weber from Prescott AZ mugs in front of his big pargo while Captain Moncho and MIke Asbury from San Diego hold the pose. There’s another big fish on the table as well! Smiling Steve Snead from Idaho! 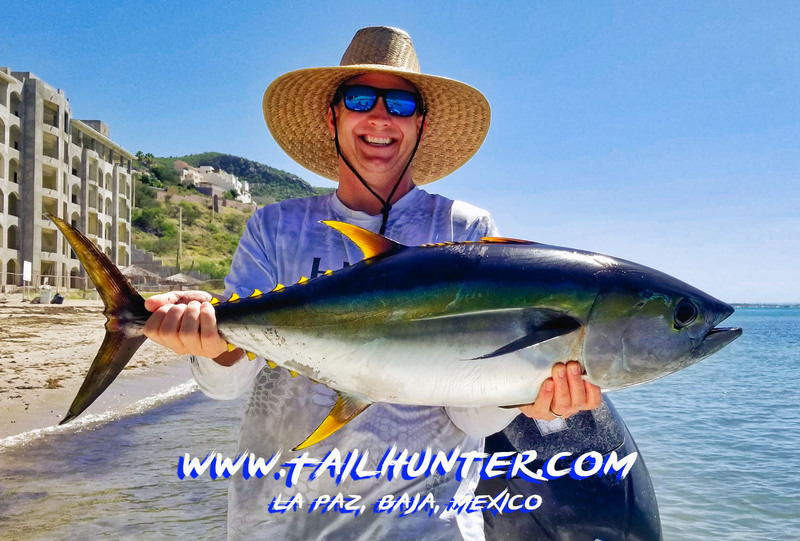 Good to have him back to visit us this past week and he got himself a pretty yellowfin tuna in the La Paz tuna bite. Fun Family and we enjoy every time they visit us. 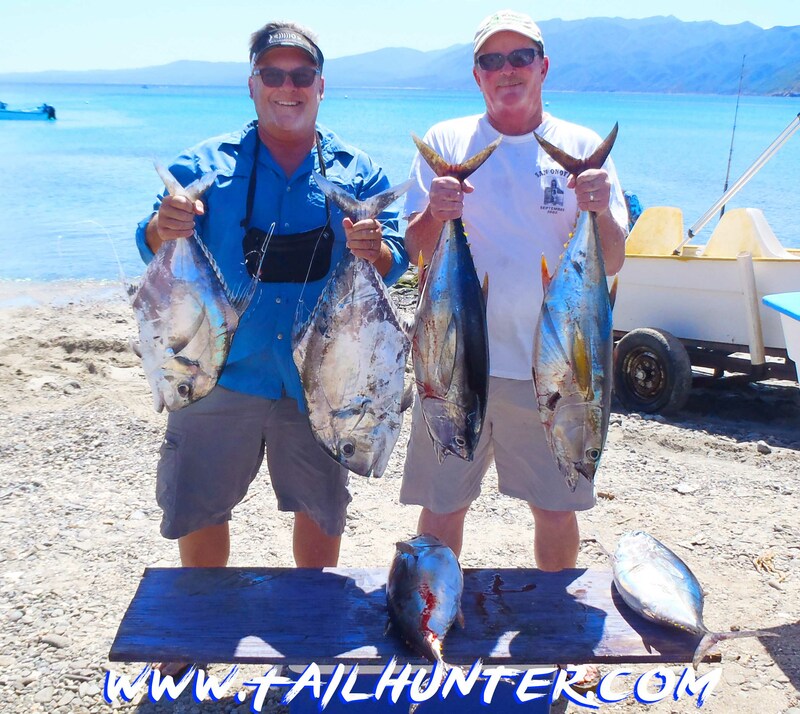 Ken and Terri Bodle from Spring Valley Lake CA with three sons, Weston, Wyatt and Mason…oh…and some nice tuna! With storm clouds threatening late in the week, Pete Wilson still stuck it to this massive dog-tooth snapper fishing with Captain Victor! Check out the photo below of the teeth! 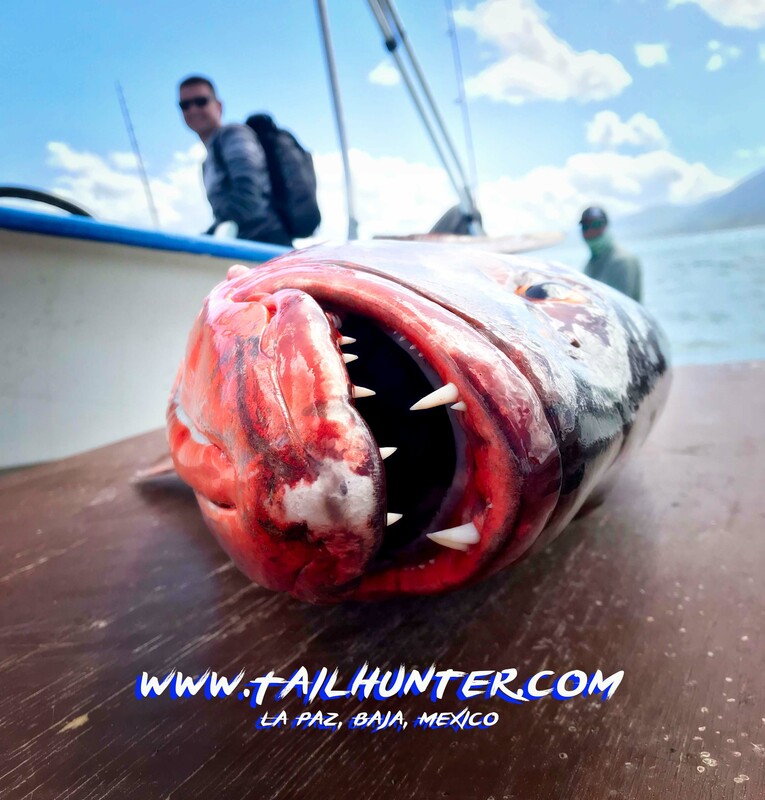 Why these pargo perro / cubera snapper are also know as “dog-tooth snapper.” Pretty fierce looking grill! This is Pete Wilson’s big doggie. His photo is above. 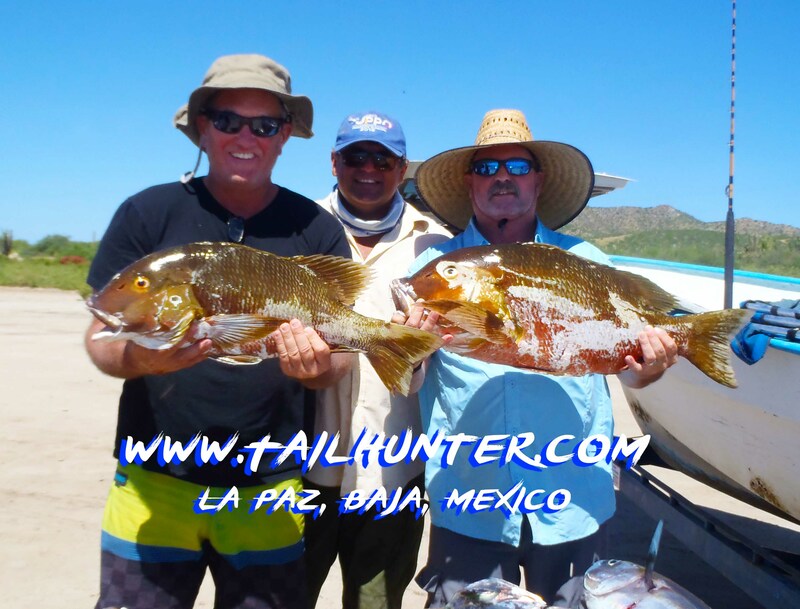 Wiley, Jr and Wyatt Randolph got a double-hook-up on dorado fishing north of La Paz their first day! Great shot! Big smile! 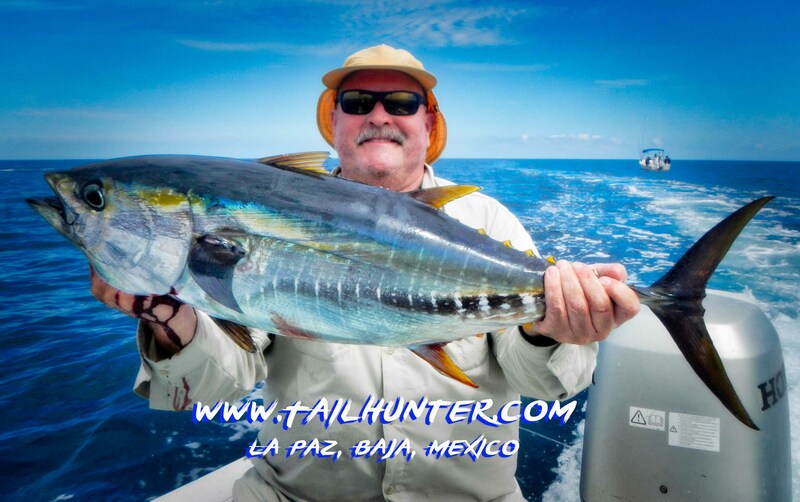 Ryan Russel from Boise, Idaho worked this big tuna with our La Paz fleet. Nice shot. 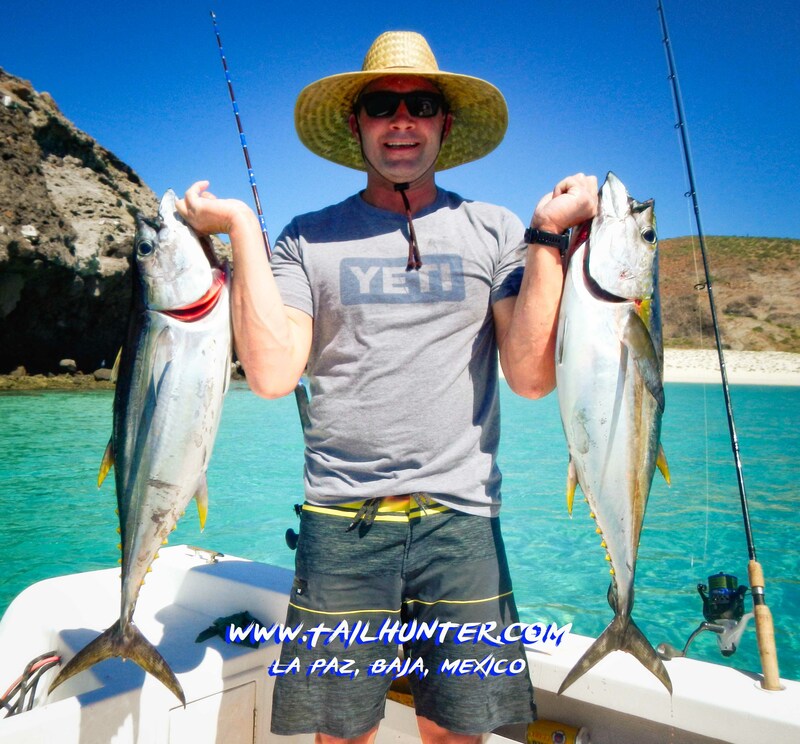 Weston with his dad, Ken Bodle hold up a couple of legit YFT’s on the beach behind La Concha Hotel! 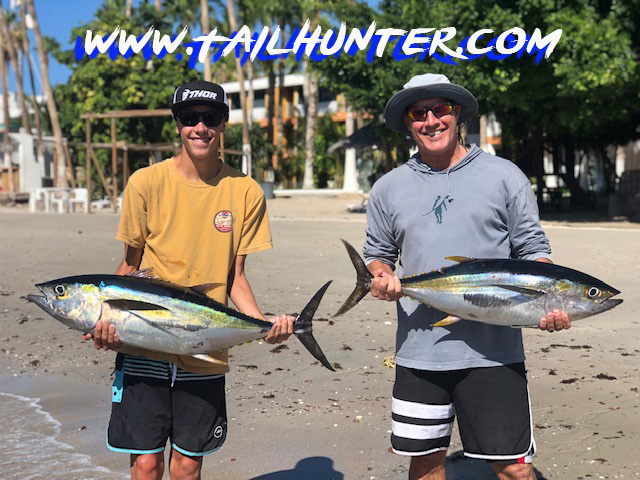 Our surf brothers, Jim Adair and Brad Baker with some nice pompano and tuna headed for the ice chest. We even got pargo liso (mullet snapper) this week! It’s not springtime either! Steve and Captain Moncho do the honors! Really unusual to get these powerful fish! Tuna on the light tackle is a handful! C.P. Shannon with two hands fulll of tuna! That’s alot of sashime fillets! 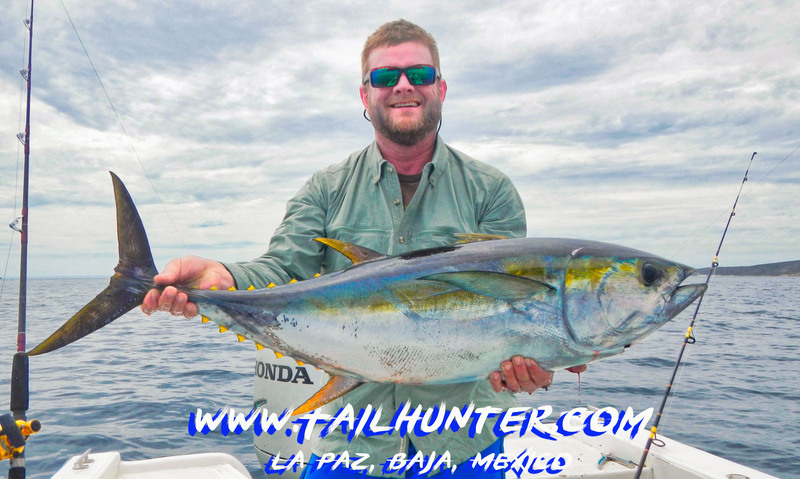 Nothing wrong with this yellowfin tuna caught by Pete Wilson after a long fight! 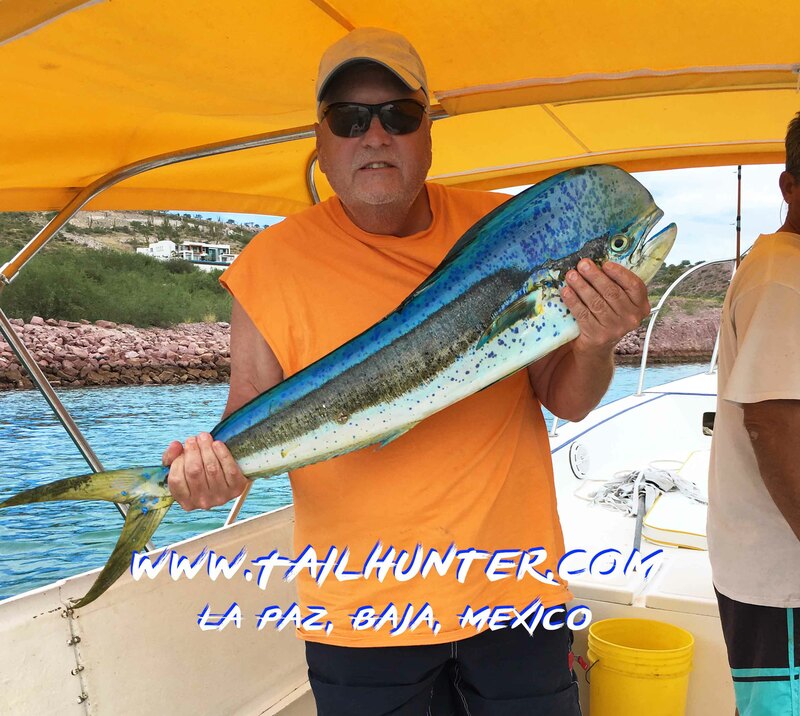 Al Rorex got his dorado after a tough week of fishing. He lost a big big tuna at the boat after a long-battle too! That’s a beast! 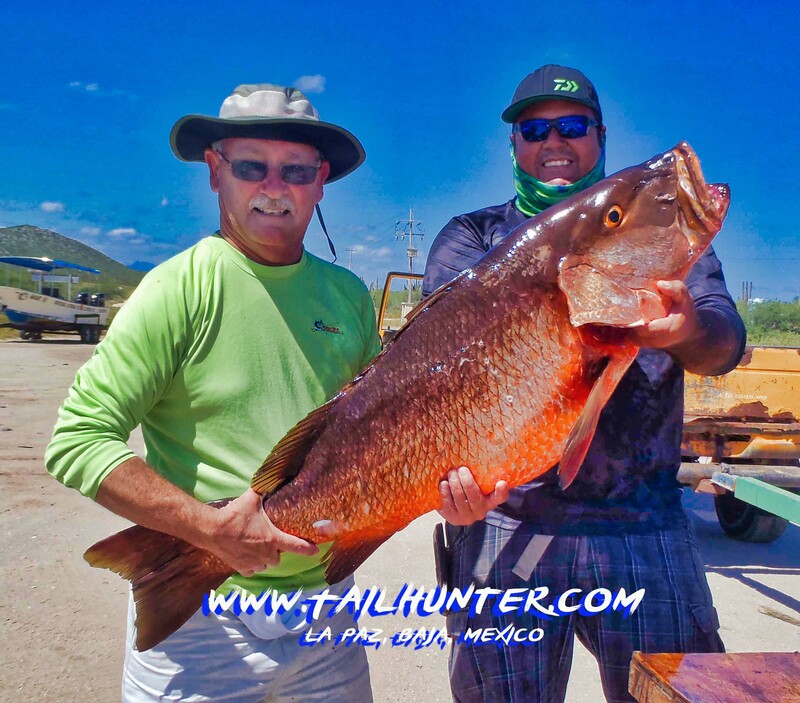 We don’t usually see pargo liso (mullet snapper) this big and usually, we catch them in the springtime! Steve and Captain Moncho! John Gibbs and Ken Campbell visit us every year and are always a kick. A couple of nice big barred pargo with Captain Armando. First day out produced Danny Okazaki’s first wahoo on a Rapala. He wasn’t sure if they were good eating until we all assured him that it was NOT just a big mackerel! 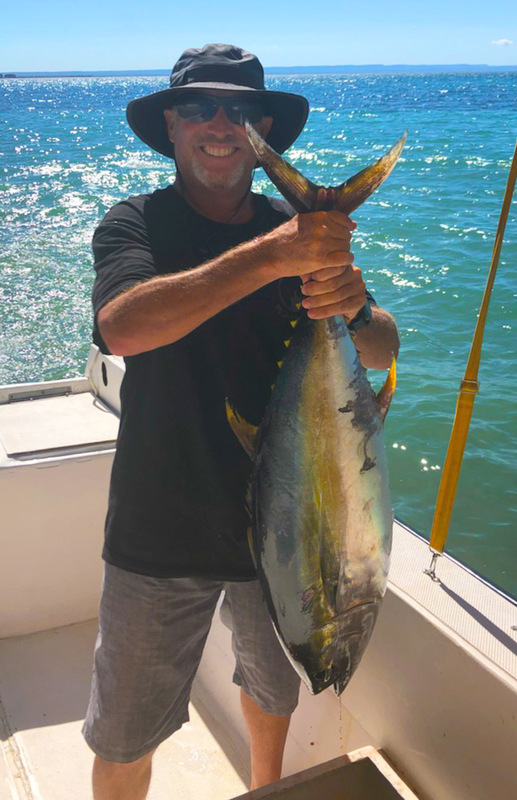 Nice tuna for Wiley Randolph! He’s always smiling. Never seen him unhappy! We always enjoy his visits every year. 1…2..3…LIFT, Henry! Lifting this big pargo knocked one of the lenses outta Henry’s glasses! Look at the teeth on the beast. That’s why they call ’em “dog-tooth” snapper. Brad McBride had a good day working the rocks inshore for a great variety of good-eating fish and lots of action on light tackle. 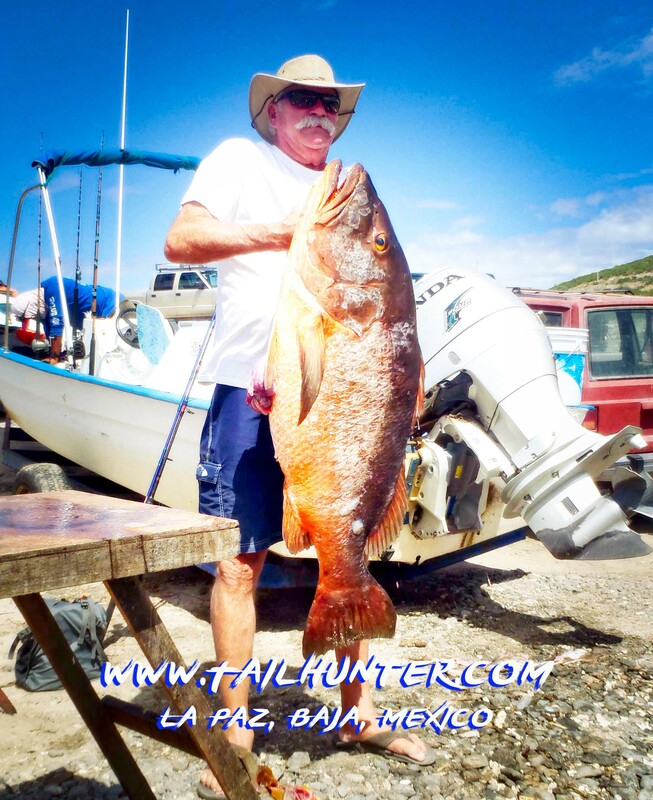 You can imagine the size of this pargo…Steve is about 6’4″ tall! 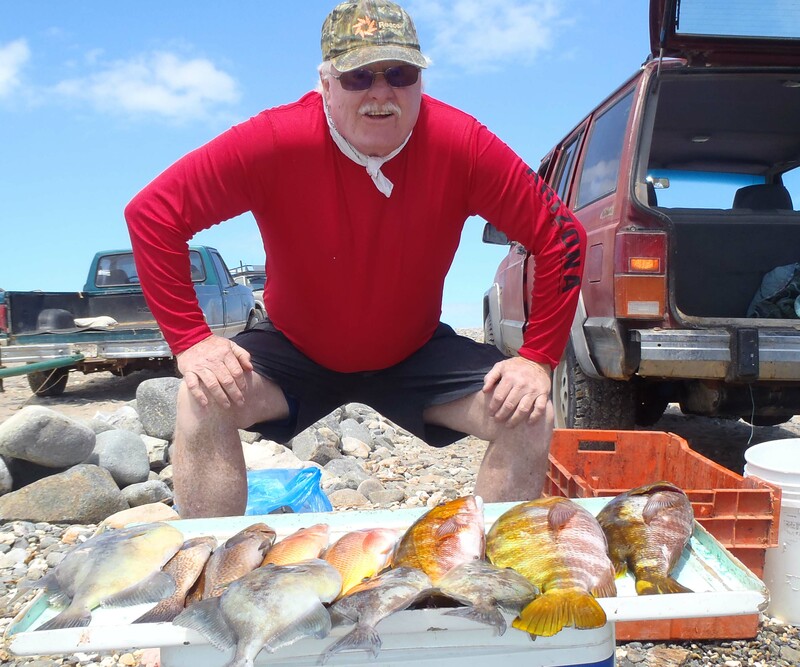 Weston and his dad, Ken Bodle with a couple of nice YFT’s on the beach behind La Concha Hotel. Is the great tuna bite of 2019 over? Has the season already changed over to cooler winter conditions? After this past week, I might have to concur in the affirmative. It was a weird strange week. First, air temperatures abruptly dropped 10-12 degrees almost overnight. The sun was still out (most of the week…more on that in a bit), but suddenly, it was like someone threw a switch and humid tropical 95-98 degree day time temps suddenly hit the mid-80’s and the humidity almost disappeared. On top of that it got windy from the south brought on by concurrent hurricanes Rosa then Sergio that played out in the Pacific Ocean and made landfall hundreds of miles north along the Baja Peninsula, but caused enough of a pressure change to bring in some fairly strong wind and waves from the south…all of which contributed to some really difficult fishing. Oh…then late-week, the “rain showers” we knew were going to happen and were supposed to be benign turned into basically a baby hurricane with the sun out! Winds of 20-30 mph whipped the ocean into a froth and strong morning rains didn’t help either. 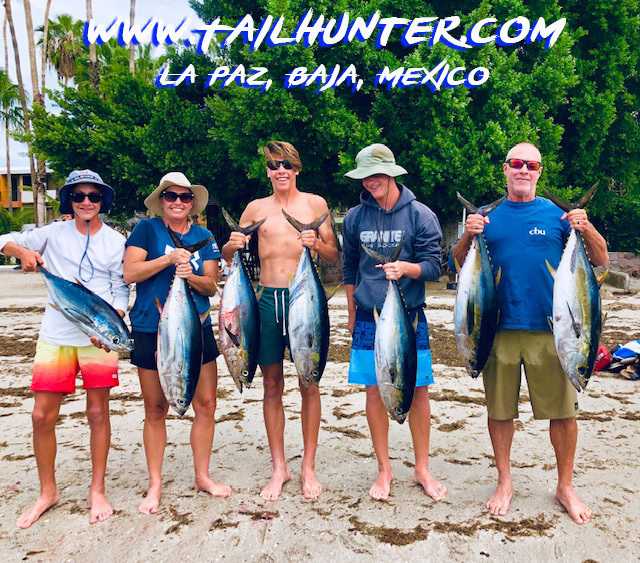 We had to shut down fishing for the most part when the La Paz Port Captain understandably shut down all boat traffic on Friday as big waves in normally calm La Paz Bay were strong enough to throw spray on cars passing by on the waterfront. It was like having a baby hurricane with the sun still out! So, fishing took the biggest tumble of the season. It went from red-hot to barely tepid. I think the fish were as confused as we were. There were a few high spots here and there and the fish were definitely there. They just didn’t want to bite or they moved to other spots. Although we got some nice tuna and some huge tuna were lost, the volume of tuna we’ve enjoyed for several months diminished. Same for dorado and other species. There were a few wahoo and way too many bonito! Our captains and anglers had t work hard to find fish and even when they did, so many of the fish were larger that many were lost which might have made our counts look better. But, just the same…action was way way off. 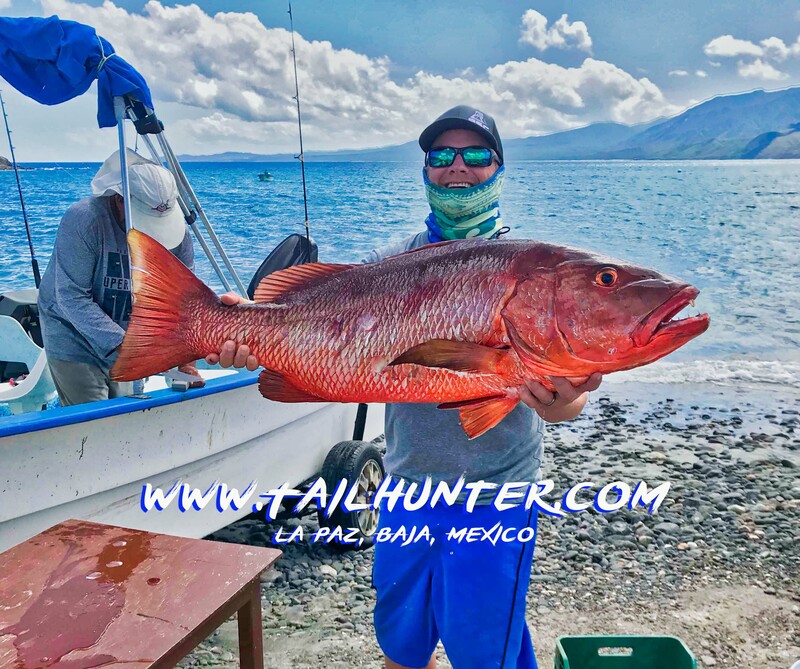 The biggest surprise was the appearance of huge dog-tooth cubera snapper (pargo perro or pargo colorado) and giant mullet snapper (pargo liso). 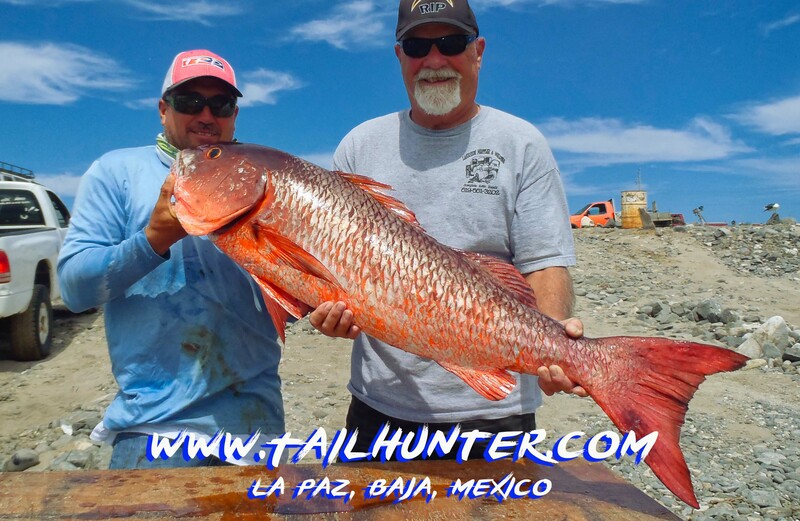 These huge red fish are generally a spring-time fish and during the season, maybe we get a half-dozen or so…maybe! These huge fierce fish are not only big, but powerful and they’re in the shallows in the rocks and reefs. They have scales like armor, sharp gills and gill plates plus set of long sharp teeth! 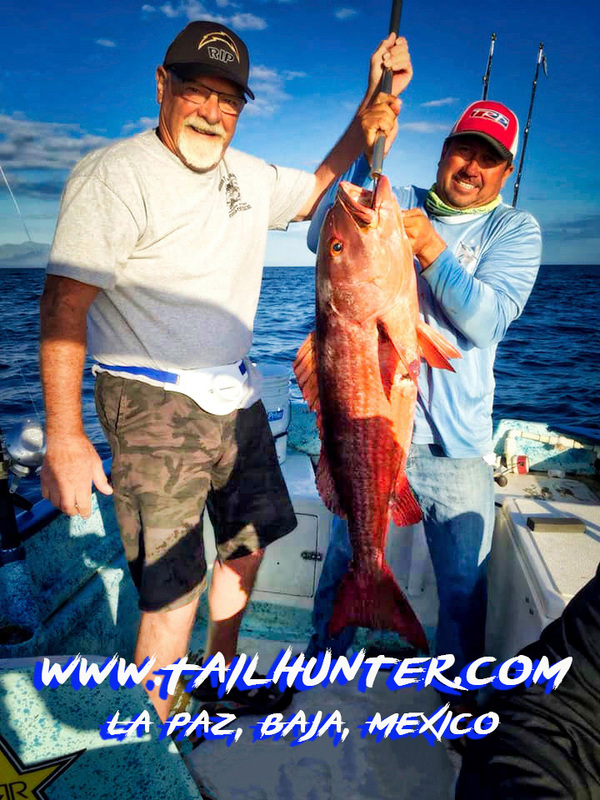 When the blue water fish weren’t biting, we went inshore for some action on pargo and cabrilla just to get the guys some fish and these big dogs started biting. More than I have ever seen in more than 20 years here. 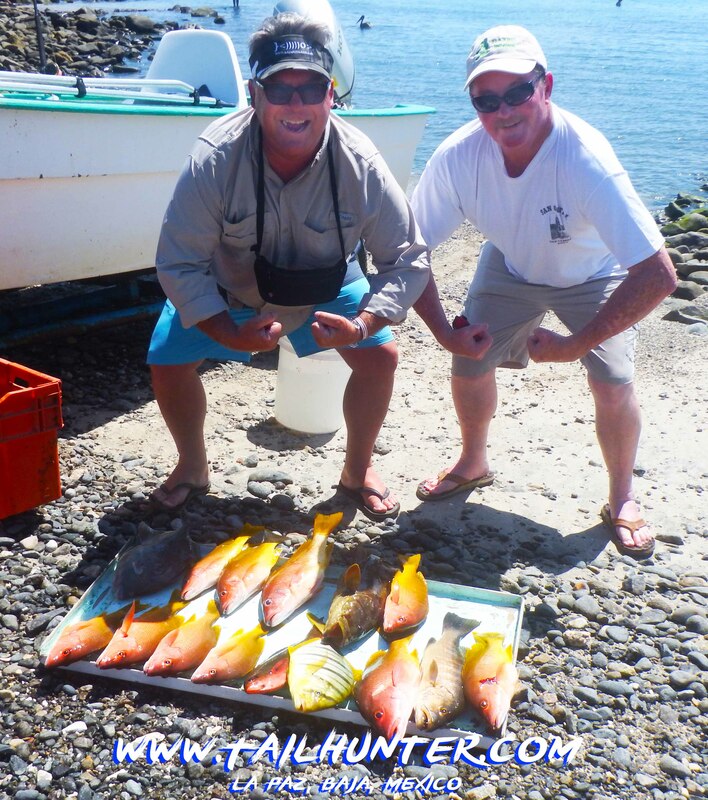 These fish were 50-80 pounders and larger ones were lost! They were breaking 150-pound test line and the guys were using whole live bonito to hook them. Guys were losing 2, 3, 4 or more fish in some cases and getting 1 to the boat, but it could be the fish of a lifetime. This coming week, it looks like the winter northern winds are starting early. The north winds are the vanguard of what we get during the months of November to April. We are also expecting a “little rain” this week again. Looks like winter might be starting pre-maturely. If the winds persist, water temps will also start to drop and the fishing will change even more dramatically.